At first glance, the XZ-2 looks to be a vastly different camera from its predecessor, with a more workmanlike appearance than the slick style of the original XZ-1. In fact, the new appearance is only really due to the addition of a two new features: a lever/button next to the lens, and a screw-on handgrip. Removing the grip goes some way towards restoring the look of the previous model, but as slight as the grip is, it makes a difference when holding the camera. The lever switch next to the lens is an interesting new feature, as it actually controls the function of the ring around the lens barrel. Flick it in one direction and the barrel controls the shutter speed, aperture size or EV compensation. The ring will click when it is rotated, so you know exactly how many steps of adjustment have been added. Flick the switch in the other direction and the lens ring controls either the zoom control or manual focusing of the lens, with the lens having a smooth motion rather than clicking. The inclusion of this lever is a nice touch, and it will no doubt be used to provide quick access to the camera’s manual lens focusing feature rather than the zoom control. On top of this, there is a function button set into the centre of the lever switch. This can be set to a variety of functions. The camera’s top-plate has the same selection of buttons as on the XZ-1, but with a few slight changes. The shutter button, power button, zoom rocker switch and mode dial have all been made larger, and they now protrude further out from the top of the camera. The mode dial is also firmer than the same dial on the XZ’s previous incarnation, which could sometimes change modes if it were knocked while being carried around the neck or if loose in a bag. There is no such concern with the XZ-2. 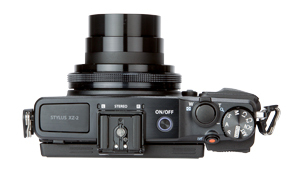 Also on the top-plate is a standard flash hotshoe, which, when combined with the camera’s accessory port, will allow the XZ-2 to use the Olympus VF-2 EVF. On the rear of the camera the button layout remains largely the same, except for the addition of a second function button, which I assigned to the camera’s metering mode. The video-record button has been repositioned, and it now sits on a ridge between the rear and top of the camera, at a 45° angle, which is a better position. The most obvious difference between the builds of the XZ-2 and XZ-1 is that the rear screen on the new camera has a tilting mechanism. This is a good thing, although it does make the XZ-2 significantly chunkier than its predecessor. More on the XZ-2’s articulated screen later.